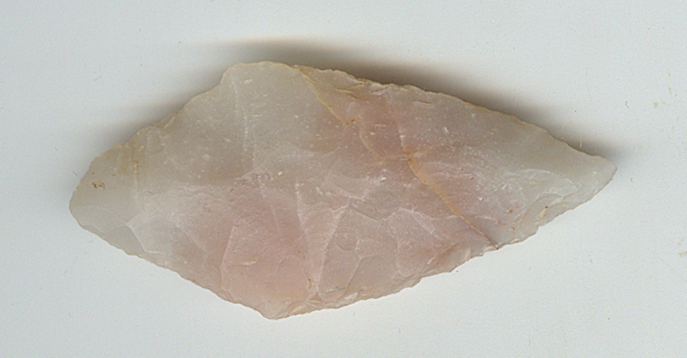 A Medium Size, Well Made, Gary Point That Exhibits Stone Sheen Coloration And Surface Frosting Patina,Mineral Deposits, Correct Blade Sharpening Reduction, Aged Soil Deposits, Deep Hinge Staining, Polished Blade Use Wear, Excellent Surface Aging Frosting, Correct Material And Manufacture For The Area Found. Found By Niki Newkirk Near Lake Eufaula. Ex-Niki Newkirk And Lonnie Hartline Coll.'s. Gary Points Are One Of The Most Widely Distributed Types In Arkansas And Oklahoma! Includes A Ken Partain Certificate Of Authenticity!